School Closings Text Alerts – WLOS Sign up for text notifications when school is closed or delayed. You will not want miss out on this fun event with Mr. Edwards, Mr. Godleski, and Coach Swain serving as Masters of Ceremonies. It’s going to be F-U-N, FUN! We hope the entire Claxton community – parents, guardians, grandparents, friends, teachers, staff, and beyond – will join us to celebrate and support Claxton at our upcoming “A Night at the Museum” Auction! Purchase your tickets now. This year’s event will be at the Asheville Museum of Science (AMOS) on March 29th from 7-10:30pm. Tickets are available online HERE. All Claxton families are welcome!—Please don’t let the ticket price prevent you from attending. For financial assistance please contact Mr. Ackerman at mark.ackerman@acsgmail.net / (828) 350-6503. Unable to attend the evening event? Or maybe you want to bid on additional items or donate to Claxton programs? You can participate through our online auction! The online auction on Bidding Owl will open on Monday, Mar 25 HERE. Check out our Facebook event page HERE to catch a glimpse of some of the awesome items up for bidding and stay posted about updates! 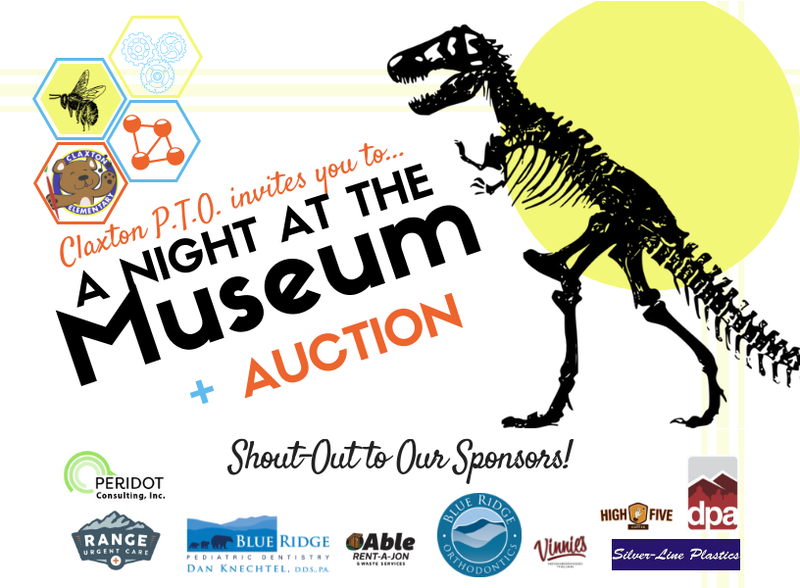 Also, we need your help to ensure our 2019 Claxton “A Night at the Museum” Evening and Auction is a SUCCESS! Please volunteer to help us with this event. We need people to help with various tasks before, during, and after the event. Please sign up HERE. We could not do this without you! Thank you! Support Claxton as you shop!